Most dogs will shed hair albeit in different amounts depending on the their breed, age and overall condition, as well as the season; the hot summer months are the times when dogs will shed more hair to cope with the heat. But when a dog losses significant amounts of hair for apparently no reason, or has bald spots, or has dull hair that easily falls off in large clumps, then it’s time to look more closely. Hair loss in dogs can be caused by underlying health issues, such as organ-related diseases, which require prompt and proper medical attention. But don’t jump to conclusions either since many cases of canine hair loss aren’t signs of a life-threatening disease – instead, it can be caused by a highly treatable condition, such as food allergies, flea allergies, and contact allergies. So, how can you determine whether your dog’s hair loss is a cause for concern? You can’t really tell unless you have veterinary training so the best thing to do is to get your pet to a veterinarian and let him do his job. Let’s start with the bad news because it makes the good news sound even better to your anxious mind. Your pet’s veterinarian will perform a thorough medical assessment including physical examination and laboratory tests to determine the cause. There are several possible causes, each of which have a corresponding treatment option. You and your vet should discuss the best treatment plan for your dog – you’re the owner, after all, while the vet has the medical knowledge. Mange is caused by mites on your dog’s fur. As your dog scratches on his itchy and scaly skin, he may scratch too hard or too long that his hair falls out in large lumps and he soon has bald spots. Allergies can be caused by contact with allergens like fleas, chemicals in skincare products, and certain foods. These can cause skin redness and itchiness, bumps, and hot spots that your dog will have the irresistible urge to scratch. If your dog is a bulldog, a Yorkshire terrier, or a golden retriever, among other breeds with a high risk of allergies, then you should be more vigilant. Trauma frequently comes from a dog’s tendency to chronically lick, scratch and/or pull at his own skin and/or hair. Acral lick dermatitis is a common cause behind hair loss. Pressure sores are common in heavy and older dogs since their bony parts, such as the elbows, are in regular contact with hard surfaces. These parts are then more susceptible to hair loss. Infections like cancer, folliculitis, and ringworm can also cause abnormal hair loss. Look for nodules, which may or may not have puss, redness, scaling, and hot spots, the signs of infection-related hair loss. Cushing’s disease, a condition caused by excessive production of cortisol, is more common in dogs six years and up. Look for signs of increased frequency of eating, drinking, and urinating, as well as a pot-bellied appearance and panting aside from hair loss. Hormonal imbalance like pituitary dwarfism, adrenal gland deficiency, and thyroid disorders can also cause progressive hair loss in dogs. Genetics can also play a part in dog hair loss. Certain dog breeds are more likely to experience bald spots in different parts of their body, typically in the outer ear, back, chest, lower neck, and thighs. These include whippets, greyhounds, Italian greyhounds, dachshunds, and Chihuahuas. Your vet will determine the best treatment plan for your dog based on the identified cause for the latter’s hair loss. You should ideally avoid applying any type of treatment without first consulting with your pet’s vet lest you worsen the situation. Antibiotics may be prescribed in case of bacterial infections. Tumors or nodules associated with the hair loss may also be removed so that your dog doesn’t scratch on them. 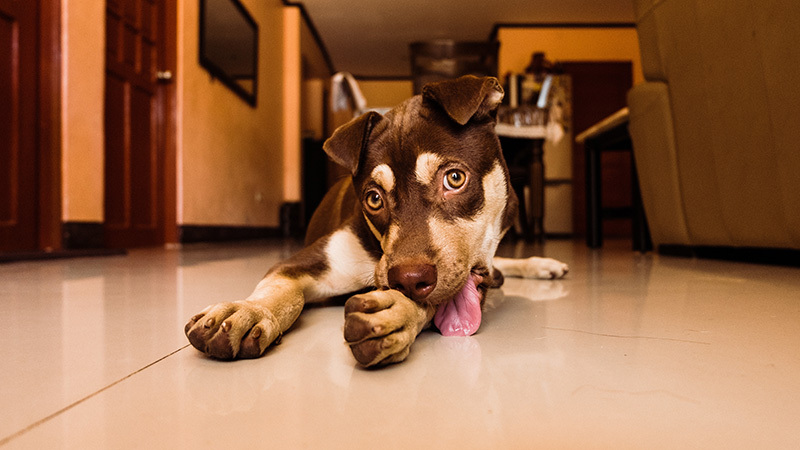 This treatment option should always be recommended by your pet’s vet as the improper use of drugs can cause adverse side effects, contraindications, and complications. Hormone therapy may be recommended to address hormonal imbalances. Your dog may soon have hair regrowth. Hydrocortisone products, particularly shampoos and sprays, are used in promoting fast healing of infected or irritated skin. These products should be directly applied on the hot spots or itchy areas; read the instructions and follow them for best results. Ask your doctor about the best hydrocortisone products instead of buying them on your own. You should also consider changing your dog’s diet so that there are no allergens in it. Wheat, soy, corn, and eggs are among the common allergens where dogs are concerned; ask your bet for dog-safe food without these ingredients just to be sure. You must also stop using skincare products designed for humans on your dog and ask the dog care experts at PetSmart about the best products for him. Unless you want a hairless dog, hair loss in dogs should be promptly and properly addressed. You will have peace of mind that your beloved pet isn’t suffering from a treatable condition.